Royal Contract Lighting is pleased to announce that we have been selected by Starwoods Hotels and Resorts as a preferred vendor for Aloft Hotels. Starwood Hotels & Resorts opened a 158 million dual-branded Aloft and Elementhotel development in Boston’s Seaport district this past spring. 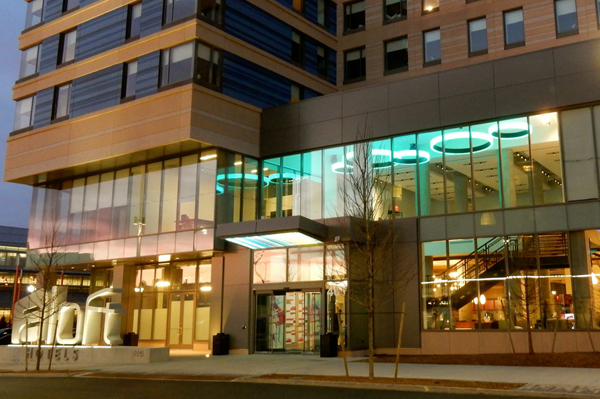 The 330-room Aloft and 180-room Element Boston Seaport, designed by locally based Elkus Manfredi Architects, are located directly across from the Boston Convention & Exhibition Center. 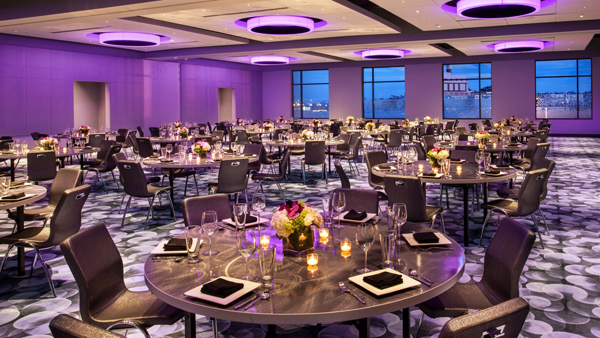 Royal Contract Lighting provided custom public space fixtures and guestroom lighting for both hotels. 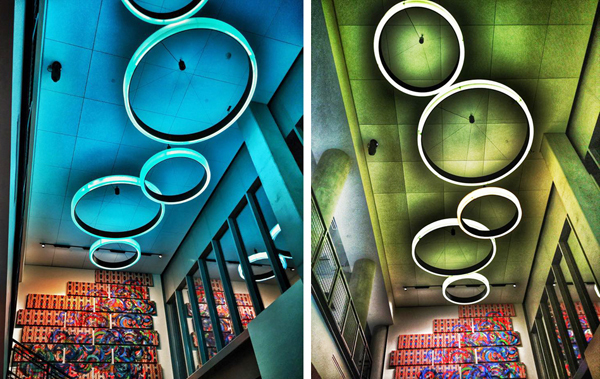 These custom ring fixtures in the stairwell and ballroom of the Aloft Boston Seaport feature RGB color changing technology with DMX controls. Aloft Boston Seaport offers leading-edge design, loft-like rooms, nearly 10,000 square feet of industry-leading meeting space. Though larger than most boutique hotels, Aloft Boston Seaport is trendy, edgy, and vibrant. Concrete columns, polished poured cement floors, and exposed pipes in the ceiling create an amenity packed warehouse loft ambience perfectly suited to traveling Millennials. Guestrooms are well designed with punches of color. The soaring, buzzing lobby features a pool table, a grab-and-go food and beverage area, and the WXYZ Bar, which draws guests for cocktails and small bites. 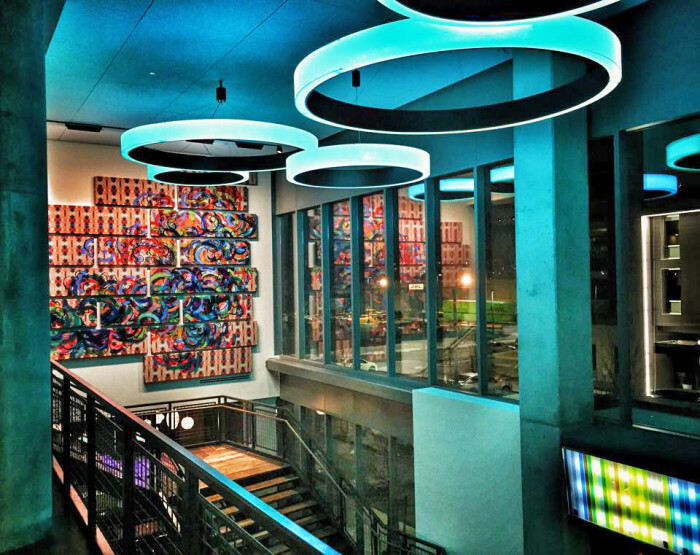 The hotel lobby will also host Aloft’s signature Live at Aloft Hotels concert series, featuring emerging artists as well as some of the hottest local bands. 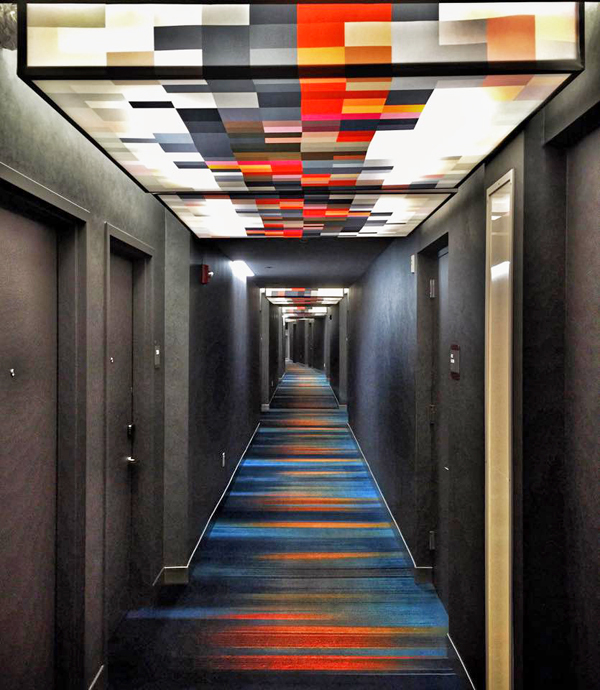 With 100 hotels open now and more coming soon in 15 countries around the world, Starwood’s Aloft brand offers a tech-forward, vibrant experience and a modern style for today’s connected, curious and communal global traveler. 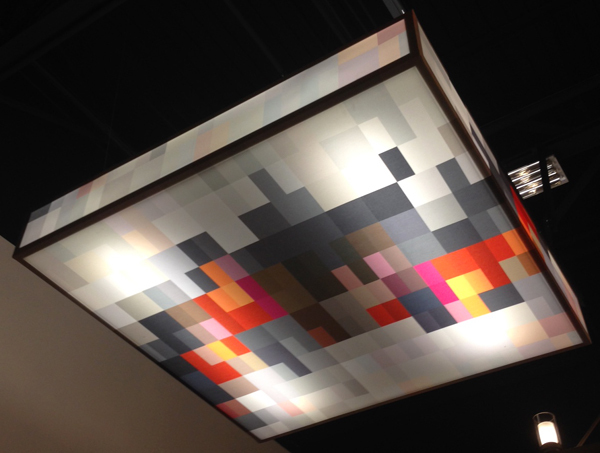 These custom fabric corridor fixtures, 54″ square in size, are a part of the Aloft Program.